I have a few ‘go-to’ places to shoot in the San Diego area, places I can count on to hopefully take a few “keepers” when the weather is right. Point Loma is one of those locations because of the view of San Diego, the altitude (400+ feet above the sea), and the numerous photo subjects readily available there. The history geek in me loves that Point Loma is where the first Europeans landed in California exploring the new world in the sixteenth century. 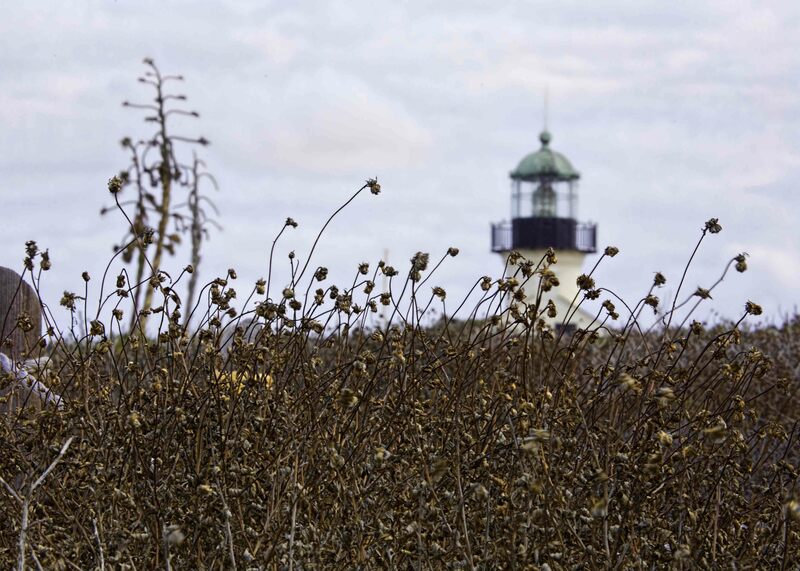 (1) There are three main locations at Point Loma that are of interest for photography; the old lighthouse, the monument commemorating the Europeans landing in California, and a national cemetery that honors many heroes of our nation. As my friends know, I hate shooting on sunny days, so when I see clouds I usually head to Point Loma or Imperial Beach, my other ‘go-to’ place (see earlier blog entry: Why I Love IB). The Old Point Loma Lighthouse is an amazing way to begin any morning. The lighthouse was first lit on the evening of November 15, 1855 and was functional for approximately 36 years until a new lighthouse was built at a lower elevation and closer to the coast. (2) On the grounds are two buildings; the lighthouse itself which also consisted of living quarters for the lighthouse keepers and their families; the other is the small museum building. These grounds are completely kid friendly and even though I’ve taken my kids here numerous times, climbing to the top of the lighthouse never get old for them! The photo at the top of the page, Distant Lighthouse, is the lighthouse captured through the grass that surrounds the lighthouse. The photo at right, The Old Light, shows the walkway around the light itself. The lighthouse itself is a great subject close-up or at a distance. It’s hard to imagine a better view of San Diego and Coronado than that from the Cabrillo National Monument. Here there are actually two views worth considering; by the monument itself and the patio area at the nearby visitors center. This monument celebrates the arrival of European explorers commanded by Juan Rodríguez Cabrillo of Portugal. The Cabrillo National Monument was established in 1913 and features a stone statue of Cabrillo commemorating his arrival on September 28, 1542. (3) Again, this is another area that my kids can run a little but need to be somewhat careful because of the cliffs near the monument area. Any time I can let my kids run and can shoot pics, it’s a win-win. The photo at left, Cabrillo (B&W), was shot with an approaching storm in front of the camera while the sun was still out behind me creating a strange lighting effect on the statue. When you travel to the Old Point Loma Lighthouse and Cabrillo Monument, you’ll pass through the Fort Rosecrans National Cemetery. The cemetery sits on the hills overlooking San Diego Bay and is a beautiful final resting for our fallen service members. There are so many incredible people buried here that, as a retired Navy Musician and former history professor, I could spend an entire day searching the historical people as well as paying my respects to a couple of former bosses. The photo at right, called The Gathering, is the grave of Medal of Honor recipient Michael Monsoor taken a few years ago around the anniversary of his death. It appeared his shipmates gathered for a beer with their friend. Michael Monsoor threw himself on a grenade that landed on a rooftop in ar-Ramadi, Iraq. His actions saved the lives of his fellow SEAL’s; you can read about Monsoon’s action on his Medal of Honor citation. Monsoor is a hero and the very definition of selfless service in my opinion. Another grave, although not a military hero in the same category of Michael Monsoor, is musician Conrad Gozzo. Gozzo is still considered one of the greatest trumpet players-ever, decades after his death. The photo below, entitled simply Goz, shows his grave not far from that of Monsoor. During World War Two, many top musicians entered military service to do their part, Gozzo was no different and joined the US Navy. Click this link to here Conrad Gozzo play Torna a Sorrento. Many times US Navy ships can be seen arriving and departing San Diego and Point Loma offers the perfect view! The photo at left, called The Meyer, was taken earn the Cabrillo Monument Visitor Center as the USS Wayne E. Meyer (DDG-108) departed for the ocean. The below photo, CVN-73, was taken from Fort Rosecrans National Cemetery as the USS George Washington departed. Both of these photos were taken with a Canon EF 70-300mm f/4.5-5.6 L DO IS USM lens, while a bit heavy its size allow me carry it daily and it sure comes in handy for moments like these. However, you don’t have to be a photographer to appreciate what Point Loma has to offer but in my case, it’s a plus. Whenever friends or family come to town, were usually make a trip to Point Loma. However, Old Point Loma Lighthouse and the Cabrillo Monument share the same parking lot so it can get busy, especially in the summer months, and on weekends. If you’ve got the time and don’t like crowds, try going during the week and you won’t be disappointed. Wikipedia, Point Loma, San Diego, 2016, https://en.wikipedia.org/wiki/Point_Loma,_San_Diego (accessed July 6, 2016). Next Post: New Peak Design Bags are out! Point Loma is definitely a place on my bucketlist now! Beautiful photography!! Thank you for the compliment! Sorry that it’s taken so long to respond, I suspended my blog about the time you wrote your comment. I was busy relocating cross country and my blog fell by the wayside. I’m restarting it this week and doing some catching up. Thanks again for the kind words.